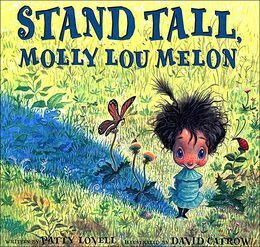 This month’s inspiring children’s book find is Stand Tall, Molly Lou Melon, written by Patty Lovell, illustrated by David Catrow. You might think that a shorty-pants little girl with buck teeth and the voice of a bullfrog would have a few, well, self esteem issues. Not so, thanks to her grandmother’s confidence boosting advice. Even when the bully at her new school tries to bring Molly down her self confidence carries her through. Although the story ends somewhat abruptly and with a predictably tidy conclusion, Molly joyfully teaches children to celebrate themselves. Someone calls you “Shrimpo?” Show them what a shrimpo can do? Someone calls you “Bucky Tooth Beaver?” Dazzle ‘em with your smile. Be sure to follow the whimsical illustrations to the very end. There you’ll discover the REAL heartwarming reason why Grandma is so very… wise. Want to take character education even further? Here’s a lesson plan presented by Scholastic to get you started. Find even more great lesson ideas from Bedford, MI K12 schools. I like how the ideas in this pdf are broken down into grade specific reading, writing, and even math categories. The suggested age range for Stand Tall, Molly Lou Melon is 4-8, but don’t let that stop your fifth and sixth graders from benefiting from this story, too. Know someone else who should learn about this book? Please feel free to share!